Print booklets for event programs and guides, church directories or special sermon series. Booklet printing at PrintPlace.com is not only fast, but affordable and high quality as well. Our booklet printing options let you easily customize a design that looks professional and is in your hands in quickly and easily. Just choose the options you want from our easy pricing tool, and then upload your own design. Same Day Turnaround: Our booklets are even available for same day turnaround services. Call us for additional custom options or fill out our custom order form. 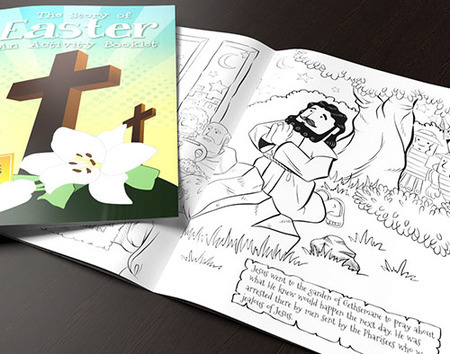 Follow our booklet layout templates to ensure your artwork is set up for great results. The layout templates are downloaded as ZIP files and come with three different format options: InDesign CS3, InDesign CS4, and Publisher. Save time and money by choosing our direct mail services. Since we print and mail from one place, your booklets will be in the mail in record time. Our direct mail services include processing of 1 mailing list, duplication removal if requested, CASS Certification, inkjet addressing, and postal presorting for automation rates, all at an affordable price. Our direct mail services cost is $35 for an order of 1,000 booklets with a $150 setup fee. Postal prices depend on the size and weight per piece. Check if your booklets will mail at Letter or Flat Rates by viewing "Booklet Mailing Requirements." Booklets present an excellent way to give a lot of information to your congregation in a compact form. They compile all of the information in a single place.